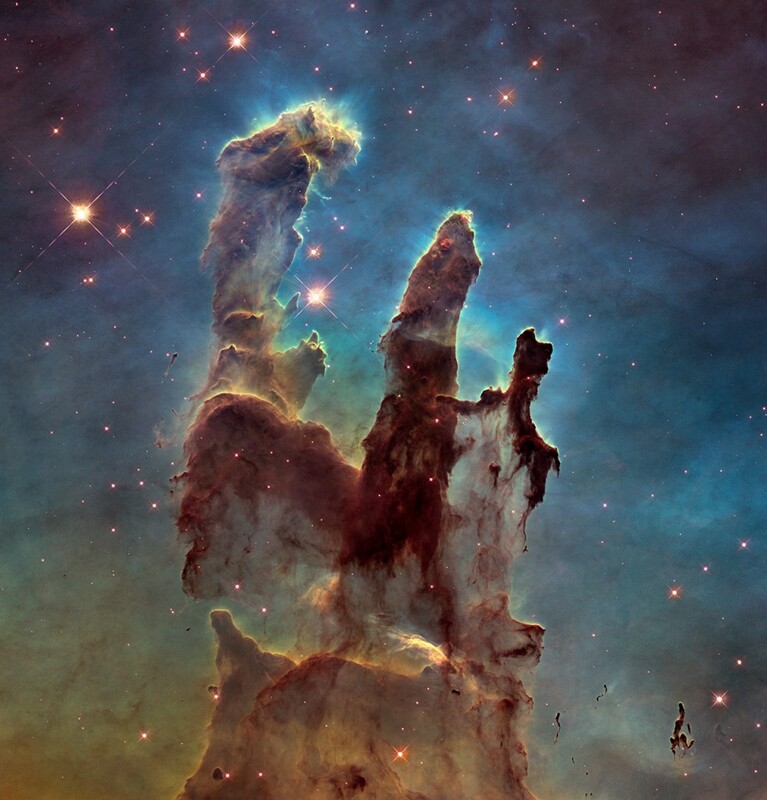 And now, in celebration of its 25th anniversary, Hubble has revisited the famous pillars, providing astronomers with a sharper and wider view. As a bonus, the pillars have been photographed in near-infrared light, as well as visible light. 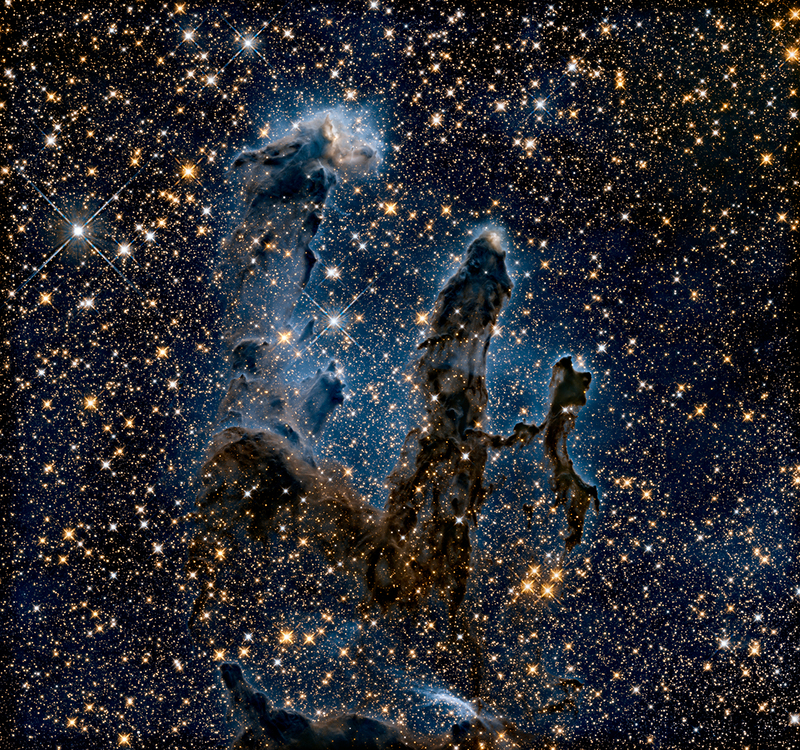 The infrared view transforms the pillars into eerie, wispy silhouettes seen against a background of myriad stars. That’s because the infrared light penetrates much of the gas and dust, except for the densest regions of the pillars. Newborn stars can be seen hidden away inside the pillars. The new images are being unveiled at the American Astronomical Society meeting in Seattle, Washington. A Near-Infrared View of the Pillars of Creation. 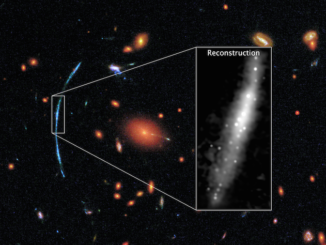 Image: NASA, ESA, and the Hubble Heritage Team (STScI/AURA). 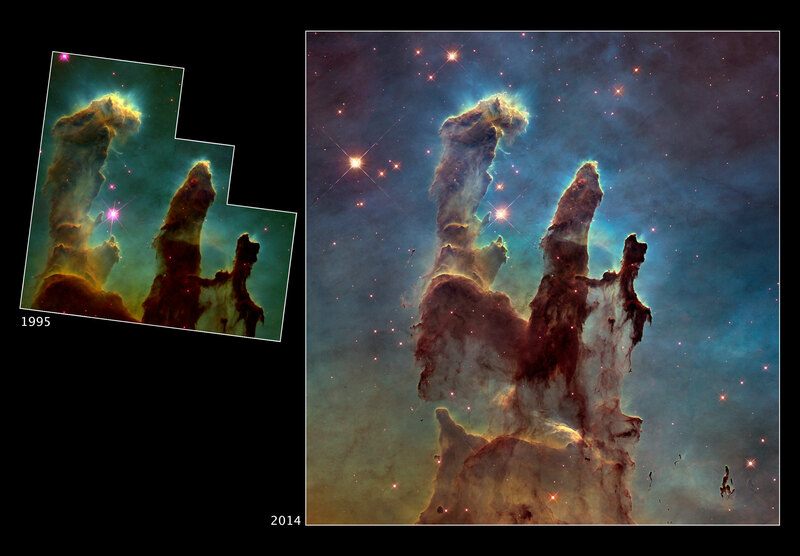 Although the original image was dubbed the Pillars of Creation, the new image hints that they are also pillars of destruction. “I’m impressed by how transitory these structures are. They are actively being ablated away before our very eyes. The ghostly bluish haze around the dense edges of the pillars is material getting heated up and evaporating away into space. We have caught these pillars at a very unique and short-lived moment in their evolution,” explained Paul Scowen of Arizona State University in Tempe, who, with astronomer Jeff Hester, formerly of Arizona State University, led the original Hubble observations of the Eagle Nebula. WFPC2 image: NASA, ESA, STScI, and J. Hester and P. Scowen (Arizona State University). 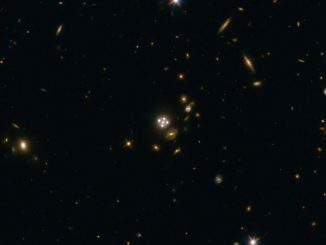 WFC3 image: NASA, ESA, and the Hubble Heritage Team (STScI/AURA). 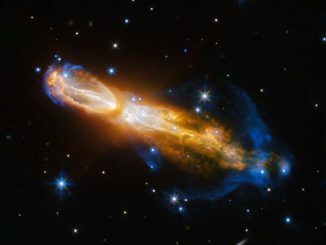 The Calabash Nebula, pictured here — which has the technical name OH 231.8+04.2 — is a spectacular example of the death of a low-mass star like the Sun.